Archaeologists in France excavating the suspected mass grave of hundreds of British and Australian World War I soldiers have found human remains. The dig at Fromelles has uncovered body fragments, including part of a human arm, but experts believe the site may hold the remains of almost 400 troops. They died during a disastrous mission in north-east France in July 1916. Many relatives are anxious for the team to find their loved ones so they can finally be given a proper burial. 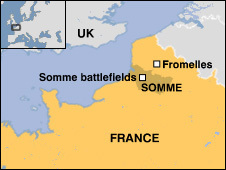 The Battle of Fromelles was intended to divert German troops from the Battle of the Somme which was raging 50 miles to the south. But due to poor planning, the mission was a complete and bloody failure which greatly soured relations between the Australians and their British commanders. For Australia, Fromelles saw one of the single greatest losses of life in the whole of the war. In total, 5,533 Australians were killed, injured or captured; alongside them, some 1,547 British soldiers were also killed. A young Adolf Hitler, then a 27-year-old corporal in the Bavarian reserve infantry, is believed to have been involved in the operation. 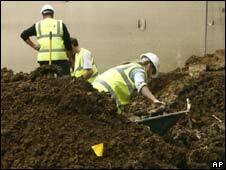 The dig, by Glasgow University Archaeological Research Division (Guard), is examining ground near woods where it is believed the Germans buried the dead in pits. With Australian soldiers standing guard close by, the team is sifting through the soil for bone, weapons and uniform fragments. 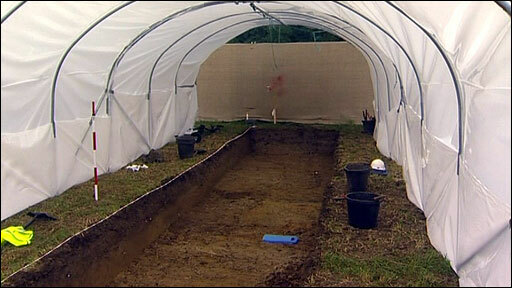 So far remains have been found in five of the eight burial pits. Peter Barton, a WWI historian involved in the dig, said he hoped to be able to determine the nationality of any remains found. "By looking at fragments of uniform, experts can tell whether they are British or Australian because they had different buttons," he said. Mr Barton said that after the battle the dead soldiers' personal possessions had been removed by the Germans and eventually returned to their families. He said it was "possible" more personal items could be uncovered if the Germans had "missed anything". Tony Pollard, head of Guard, said markings in the ground showed the shape of the German spades that were used to cut the burial pits. And he said metal rings from German stretchers used to carry the bodies had also been found. Major General Mike O'Brien, who is overseeing the dig, told the BBC the battle had been "a disastrous day" for Australia, with "terrible casualties". "On the other hand, the aim of the battle was to distract the Germans from reinforcing the battle of the Somme and you could look at that as one of the achievements of the battle - but an achievement at a terrible price." Maj Gen O'Brien said the "slow and methodical" excavation was important for the whole of Australia. "If the remains are still here, we need to find out the number and condition and perhaps decide whether there is a better way of commemorating them than leaving them here just as they are in this field," he said. On the site of the nearby battlefield stands a statue of an Australian soldier carrying a wounded comrade. In a local cemetery, the remains of 410 unidentified Australians are buried alongside the names of 1,300 others who have no known grave. The work is being overseen by the Commonwealth War Graves Commission and has the consent of the French, British and Australian governments. If a mass grave is discovered, the countries must decide whether to exhume and rebury the bodies in a new cemetery, or to leave them in place but build a memorial on the site.